As yesterday was CT’s last day of official sick leave, we felt a celebratory day out was in order. We decided to take the train down to Penzance so we could walk along the sea front to Newlyn and then revisit the Honey Pot. It was a cold and blustery day and having surveyed the boats, inhaled diesel fumes and the smell of fish at Newlyn, we felt in need of sustenance. We came across a lovely little takeaway, Aunty May’s, which also had a couple of seats. The fishermen took the takeaways, we took the seats. We had delicious felafel filled paninis followed by …. you guessed it – very nice home made cake. For once, I didn’t have chocolate cake so I won’t bore you with the details, but CT did. On the way back to Penzance, we wandered through the various parks and back alleys that seem to crop up everywhere. After much leisurely wondering we set off to the Honey Pot. They had even more chocolate cake than the last time we were there, I counted 10 different varieties, including gluten free ones. A warming cup of Earl Grey went very nicely with the cakes we eventually chose. It was difficult to make a choice – the Ginger Pave was very tempting, so were all the others. In the end, mine was a delicious slice of Apricot & Amaretto Pave and CT had a whopping slice of the Ganache cake. I’ve not made a pave before so will soon be scouring the internet for recipes. We were not disappointed; we both smacked our lips all the way to the station, which, as luck would have it, was downhill all the way! How lovely to get a ‘taste’ of Cornwall. I could almost smell the sea air. Pang! Enjoyed your post. I had a stroll through Penzance many years ago and enjoyed the history and pastries! That sounds like a wonderful way to spend a day, with the gorgeous chocolate cakes as an added bonus. What a lovely day out and chocolate cake heaven. Elisabeth – I know I’m very lucky to live near the sea. Went again today – no cake this time though, we were gathering seaweed for the plot. Country Mum – Yes, we really enjoyed wondering around. Despite being in the same county, it’s not somewhere we know very well. Kath & James – It was a great day, but to tell truth, I’m a bit caked out now. I expect it won’t last! I love Cornwall, what fabulous cakes. So got to go to the Honey Pot. CT’s cake has my stomach in hunger pains! Wow, these cakes look wonderful. That ganache cake looks particularly tasty! “Cake crawl”…it has such a lovely sound to it!!! PS. about the buttercream, the butter should be at room temperature – soft but not molten. It all sounds like a lovely day out. Especially getting a whopping slice of ganache cake. I like the look of that last one too, with the great big bit of butercream in the middle. Those cakes look fabulous! You never see such a wide variation of chocolate cakes in any of our wee Glasgow cafes 🙁 thanks for letting me live precariously through yourself tee hee! I’ve never been to that part of the U.K. I plan to one-day, Truro and the Eden project are on my list to visit. And those cakes, mmmmm – what can I say, except mmmmmm. Chele and Jenny – it was so hard to make a choice. Issy – thanks for heads up on Penlee Gallery. We did go there and the cakes looked great, but we were saving ourselves. There’s nothing for it, but a return journey and soon! Caked Crusader – thanks for tip. Cake crawl sounds good, tastes even better – try it. Vegboxboy – We don’t always manage it but do aim to have a day out that ends in a whopping slice of cake. Catherine – it is a bit of a rarity down here too – hence our pilgrimage. Katie – the challenge is now to produce something as good at home – and save the train fare. Mangocheeks – Truro is a lovely city and you will love the Eden Project where you can see cocoa pods growing on the trees. There are so many other wonderful places to visit down here though, you better make the visit a long one. Thank you Sushma for being kind about my blog – it’s always so nice to get a bit of appreciation. Those cakes look fantastic, I would have chosen the same as you, the pave looks really good! oh I so miss the little English tea shops would you like to do me a guest post like this? Rebeccasubbiah at yahoo dot com and go on have an egg curry!! ah, is gluten free french cake the secret to the nations slender womenfolk ? Ten varieties of chocolate cake! Wow..
Love the photo by the sea..
I’ve never heard of pave in a dessert context (diamonds and steak!) I look forward to seeing what you do with it. That ganache cake looks amazing. What a fantastic way to spend a day! I admire your stamina, too… that’s quite some going! Mary – thank you for the invite. Sam – you have great taste. I think with all your cycling, you might have deserved it little more than me. Rebecca – I’ve just made the egg curry, it was really good. CT being an egg lover particularly enjoyed it. A guest post sounds a bit scary as I’ve not done one before, but as already arranged with you I will have a go. Nic – ummmm, perhaps I should go gluten free then! Celia – You can see why I might have been overwhelmed. 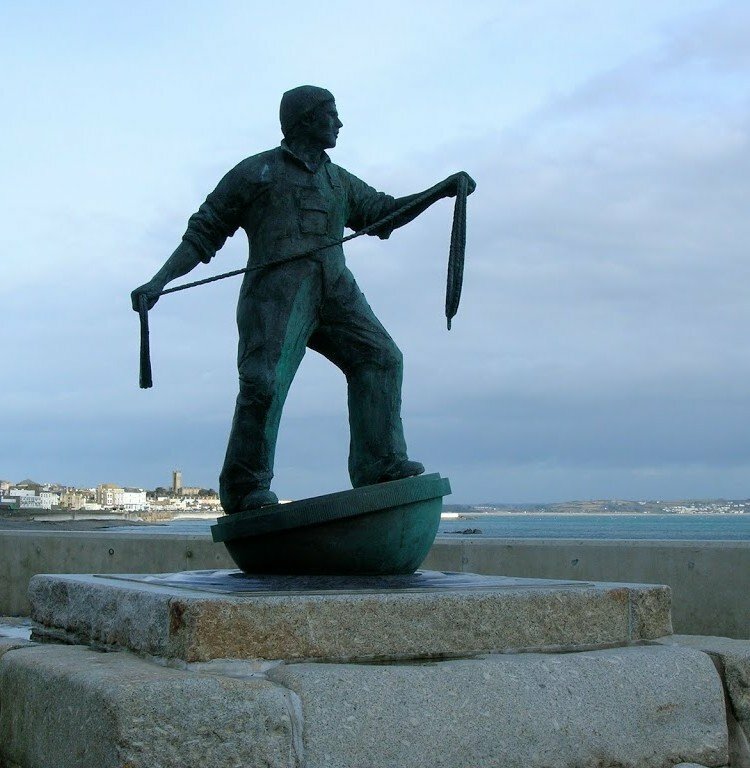 The statue in the picture is a fisherman taken at Newlyn which is an old fishing village. Jannett – Glad you enjoyed my blog – hope you make another visit. I’m only just getting in to Earl Grey – I’m normally a green tea drinker, but it’s definitely growing on me. Foodycat – yes, I think I might find it hard to find a pave recipe that matches up to that one. aforkfulofspaghetti – not so much stamina required as restraint! Next time you go on a cake crawl can you invite me along love a bit of cake…. Actually is would be great to have a route map for a cake crawl, for places in the South West ! I think you can do something with Google Maps via their API. Sounds like another great idea Sarah – will try and investigate that.